Are You Nuts about Nuts! Nuts and seeds contain many essential nutrients, proteins, vitamins and minerals and essential fatty acids. They can be eaten raw, roasted with seasonings, used as seasonings and toppings, in salads to add a bit of crunch, slivered, chopped, flaked, ground into meals, flours and milk. You can use the meal to coat chicken and fish, use in cakes, biscuits and slices. They are easy to carry around as a snack and you can mix them up with some organic dried fruit, use in a muesli bar mix or breakfast muesli. Nuts contain anticancer, heart protective properties and unsaturated fats. It is of more benefit to use a high calorie nut as a snack replacement as opposed to a chocolate bar or muffin in the afternoon as they provide more nutrients per calorie of those baked goods. Not many other foods contain such a range of nutrients as nuts and there are such a variety of nuts to choose from it makes it easy to add them into your diet. 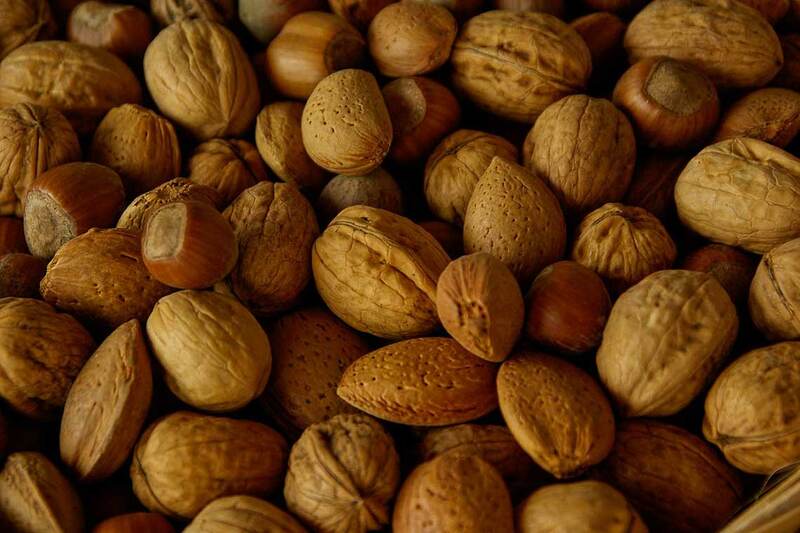 Pecans and peanuts – regulate insulin but they are some of the most common nuts to affect someone with a nut allergy. Brazil nuts – contain antioxidant selenium, have a high unsaturated fat content, are high in protein and high in amino acids. Walnuts – studies have shown that these nuts have cancer fighting elements, provide Omega 3, assist in the reduction of cholesterol, are high in protein and provide some iron. Almonds – assist in the reduction of cholesterol; have a high mineral content, and are alkaline. Macadamia nuts – high in calories and unsaturated fats, so do limit the amount of these ones especially the ones with chocolate!! Due to the fat content in nuts they can become rancid so it’s best to store them in airtight containers, in the fridge. But it’s not only nuts that are a supernutritious, seeds are too. Pumpkin, Sesame and Sunflower seeds are all edible and rich in protein, phosphorus, calcium, iron, flouride, iodine, potassium, magnesium, zinc, B complex, vitamins A, D and E. Unsaturated fatty acids. What more can you ask for in a snack?! Sesame seeds are also high in calcium and contain up to 50% protein so a spread of tahini on your toast in the morning is a really good choice instead of margarine and jam! Sunflower seeds are nutritional power houses. They are rich in protein about 30%, unsaturated fatty acids, phosphorus, calcium, iron, fluorine, iodine, potassium, magnesium, zinc, several B vitamins, vitamin E and D.
Sesame Seeds are high in protein, unsaturated fatty acids, calcium, magnesium, niacin and vitamins A and E.
Seeds also go rancid and need to also be contained in an airtight container and the fridge. So make sure you consider a power packed nut and seed mix as a handy snack to keep in your bag, add some seeds to your stirfry or nuts to your salad. You really can’t find a healthier and tasty option!